With the Tour de France 2006 starting tomorrow, I just wanted to repost a link to this excellent collection showing the routes of to all the stages of this year's TdF. This collection is being maintained at this thread at the Google Earth Community. Once you download the Tour de France 2006 GE File , you should save it in your My Places for the following two reasons: 1) the file may be updated for greater accuracy, and 2) the author plans to add some dynamic updates which will let you follow some of the action in real-time. For more details on this, check out the earlier Tour de France 2006 story. If you're planning to go watch the TdF, you might want to find hotels near the various stages. 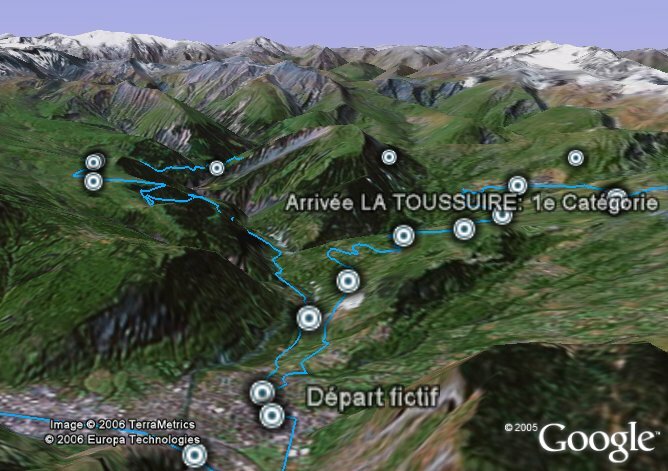 Check out Earthbooker which lets you fly over the various stages and find hotels in Google Earth. They have Earthbooker available in several languages now. Check out Earthbooker in English , Francais , Espanol , or Deutsch . Thanks for the Tour Geo-Data! This will be a tour to remeber on way or another! This Tour will be excited nevertheless. I equipped 3 cars, 2 from BOUYGUES TELECOM team with a GPS. You cab track it dowloading my freeware on my website. Enjoy it !